Items To Bring: Camera, photo ID (for anyone 18 yrs. or older) and if you should forget anything, visit our gift shop. Enjoy the "Entertainment Capital of the World" from the best view possible - the sky. 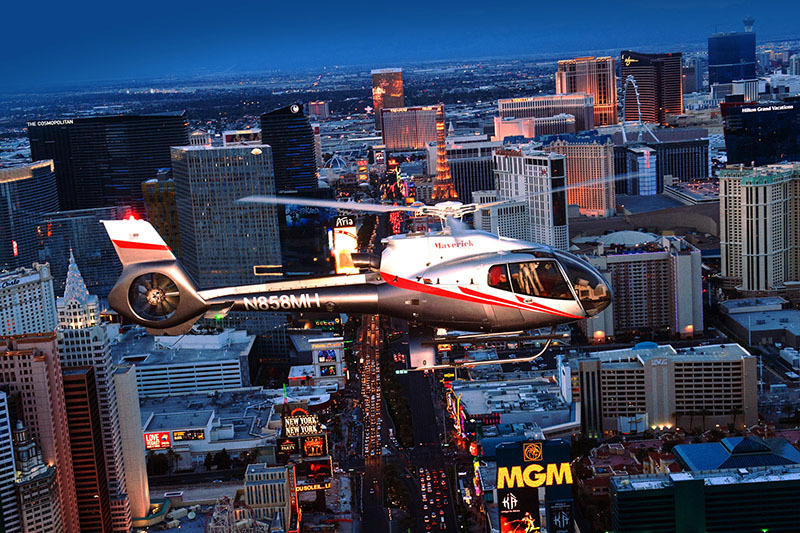 Vegas Nights is an amazing Las Vegas helicopter tour flying over the megaresorts of the Las Vegas Strip from the New York-New York skyline to the Bellagio fountains and the never-fading light of the Luxor pyramid. 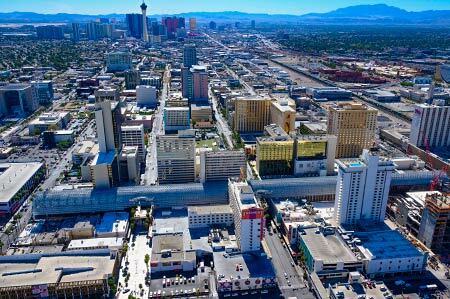 You are also afforded unparalleled views of Downtown Las Vegas’ historic Fremont Street, home to the city’s first casinos. 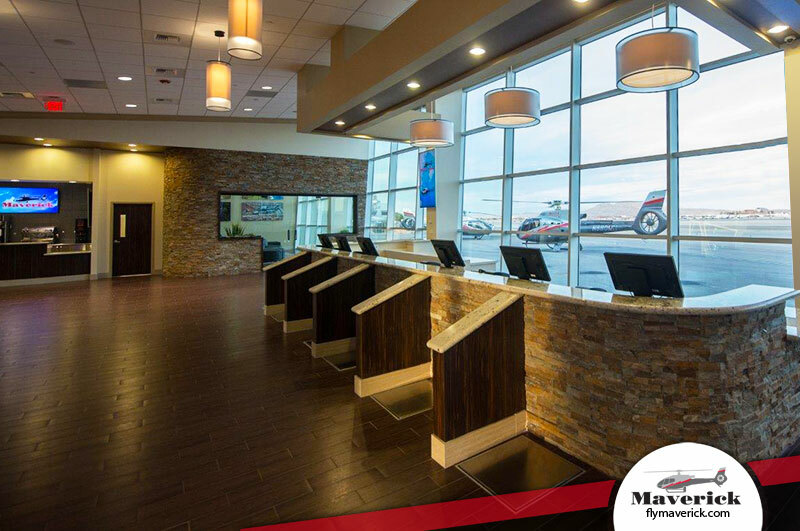 Prior to your departure from our Las Vegas terminal, you will be served champagne. 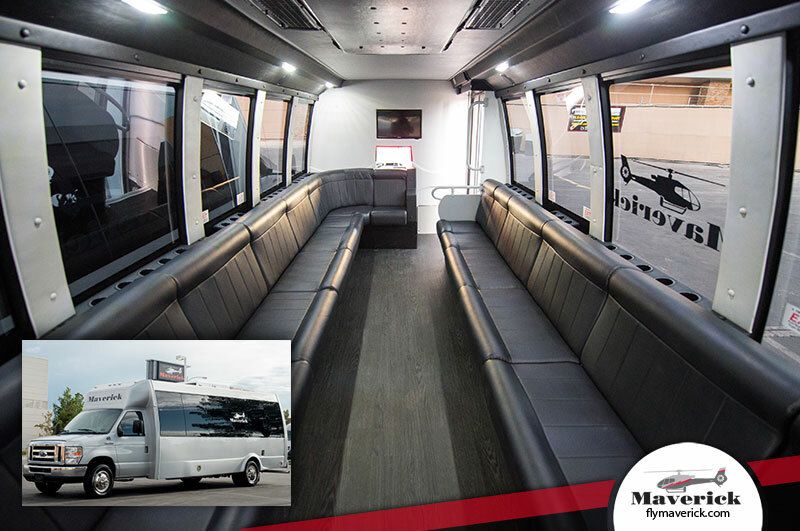 Then, you will experience breathtaking sights from inside our ECO-Star helicopter, the limousine of the sky. Our helicopter ride was a once in a life time 15 minutes! Every bit wort... Our helicopter ride was a once in a life time 15 minutes! Every bit worth the fee! Thank you! Amazing trip over Las Vegas Strip by night! Service from pick-up, check in & o... Amazing trip over Las Vegas Strip by night! Service from pick-up, check in & of course flight were excellent. Our pilot Landen was so pleasant and made us feel so relaxed and welcomed we knew we were in safe hands, thanks so much for such a great experience, we will definitely recommend you!! 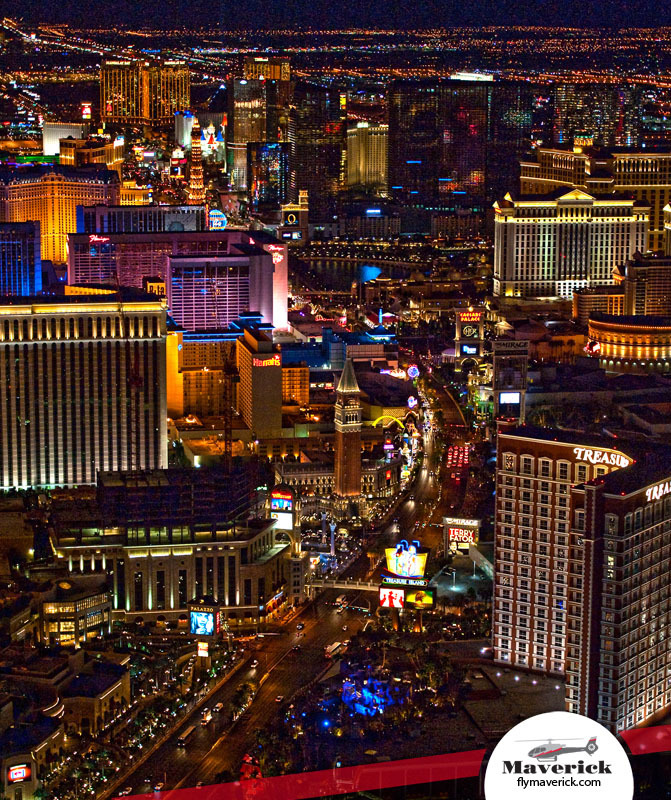 The Las Vegas Strip At Night: Tripping The Lights Fantastic! What I love most about Las Vegas are the lights. My favorite moment of driving home at night from a weekend trip to California or Utah is when a warm glow, almost like a halo, begins to break out on the black horizon—and it grows and grows and grows until it becomes a bona fide light extravaganza. I also like landing at night at McCarran International Airport for the same reason. There's just something magical about the way the lights of Las Vegas take shape in the desolate desert and soon become overpowering. It truly stirs the soul. 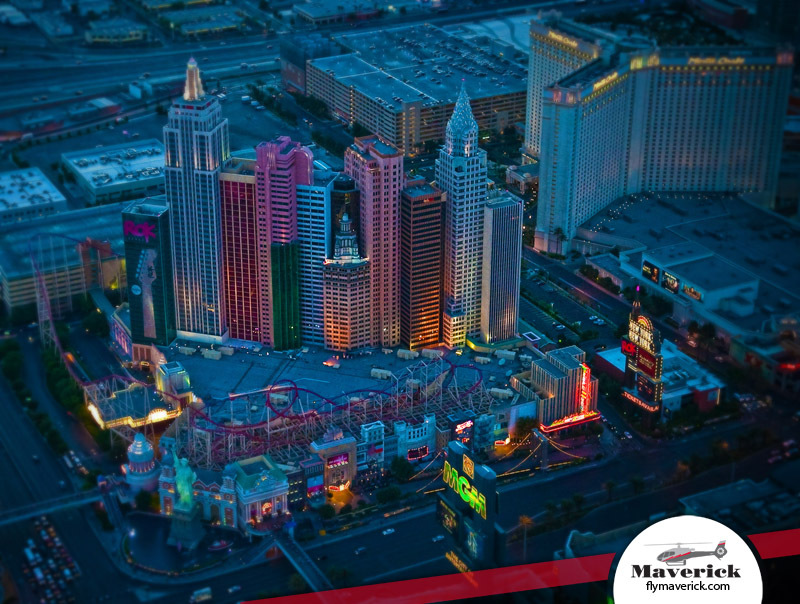 Thanks to Maverick Helicopters, I recently got a chance to see Las Vegas' lights from an entirely different perspective. 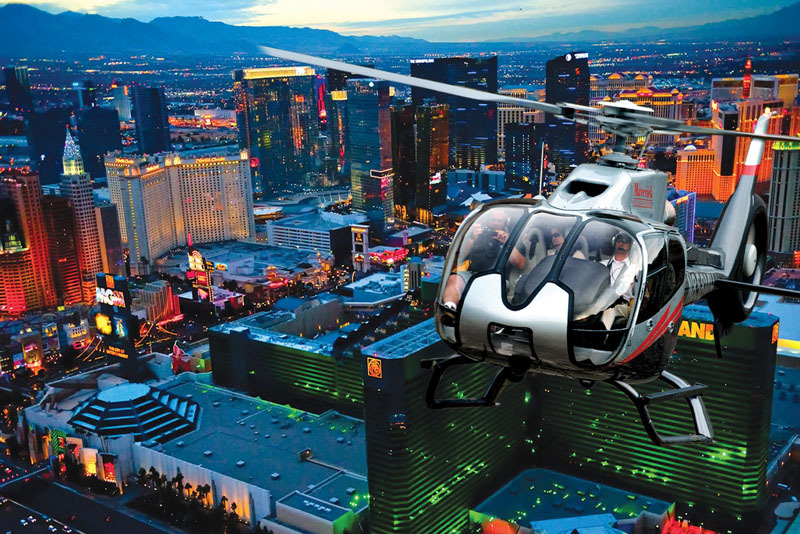 The company offers a Vegas Nights tour, which is an evening helicopter flight above the Strip. 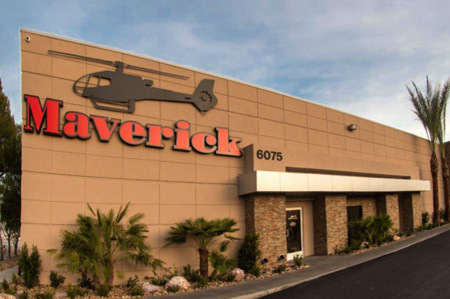 It departs from Maverick Helicopters' main terminal, which is located south of Mandalay Bay and across from the famous Welcome to Fabulous Las Vegas sign. I arrived there early and found both the staff and lobby to be pleasant. The check-in process was easy. I was asked to show a photo ID, and then I was weighed. Luckily, it's a discreet floor scale and no one told me what my weight was—as that might have lessoned my delight upon being served a free glass of champagne. While sipping my bubbly, I made myself comfortable in one of the black leather chairs and took a look around. The lobby is light and airy and a perfect backdrop for some stunning photographs of Las Vegas and the Grand Canyon. Large-screen TVs were even showing a video montage of the Strip, which only heightened my anticipation of the flight. I couldn't help but notice a young couple dressed in a tux and white gown. They had checked in and were getting ready to be married on a private helicopter flight. The pastor was going over the last-minute details for their midair ceremony—and I could only imagine the glimmering scene that would envelop them when they would recite their vows. Soon my name was called and I joined two other couples that were scheduled for the same flight. We got a brief safety lecture covering the basics, like standing away from the dangerous rotor blades and where to find the fire extinguisher. I did make a mental note about the location of the "motion discomfort bags"—just in case. Our pilot was Chris Spircu. He walked us out to the helipad and joked, "Besides me, who else is flying in a helicopter for the first time?" The humor and his all-around confidence put me quickly at ease. We posed for a souvenir photo in front of the aircraft and then were helped onboard. It was roomy inside, even with eight leather seats. Trying to decipher the multi-buckle seatbelt was a bit like doing a Rubik's Cube. Needless to say, once I'd gotten the two shoulder straps and waist strap latched, I felt well secured to the helicopter. After that, Spircu gave us a quick rundown on the headsets and microphones, which would not only help drown out the sound of the rotors, but also allow us to communicate with each other. Before I knew it, the Survivor song "Eye of the Tiger" began playing in my ears, and as I heard the words "Risin' up," so did we. We were lifted a few feet off the ground and began to make our way toward a short runway outlined in blue lights. Next, the helicopter leaned noticeably forward and then it gently took to the air. There was no stomach-dropping sensation that I usually get on roller coasters. In fact, it felt smoother than taking off in an airplane. Moments later, we were cruising just above the roofs of all the famous hotels that line the Strip. 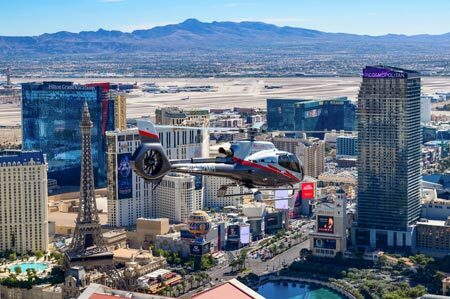 I can honestly say that if you want to experience a unique view of Las Vegas—one that not many visitors see—this is it. First, I saw Mandalay Bay and its spectacular swimming pool area. Then, there was the Luxor pyramid, where I looked down upon the towering sphinx. I also got a close-up of the colorful spires atop the Excalibur before we flew by the splendid skyline of New York-New York. Our journey took us over the emerald green MGM Grand, where we looked down upon the massive lion that bravely guards its entrance. We continued along the east side of the Strip, where we drifted over the sleek new tower being constructed at the Planet Hollywood Casino & Resort. It's coming along quite nicely. Each second of the flight was filled with a new visual discovery. I couldn't believe that I was seeing the city's famous hotels and marquees from this unusual vantage point—and while they were illuminated so majestically. What could be better than an after-dark sightseeing trip like this one? For example, one of my favorite sights was the Eiffel Tower replica at Paris Las Vegas. I spotted both couples onboard holding hands as we passed by it, and I was even feeling a bit romantic with that sparkling structure lingering just below. At that moment, a man wouldn't have to work too hard to woo me! And do you remember the commercials in which Steve Wynn introduced his Wynn and Encore resorts while sitting atop the copper-colored buildings? Now I can appreciate the guts it took for him to film them after catching sight of the sloping roofs. I can hardly believe he sat so calmly with his legs crossed while dangling his feet above the Strip. Next up was the 1,149-foot Stratosphere Tower that looms over the city. It was amazing to hover above its pod and hear people screaming out with fear on the thrill rides. For a connoisseur of lights, Downtown Las Vegas (aka, "Glitter Gulch") and Fremont Street Experience's canopy, which is comprised of 12.5 million LED bulbs, do not disappoint. The entire area was radiant and beyond it the whole desert valley lay twinkling in the night. To me, it looked a lot like Christmas. At that point, Spircu made a U-turn and I got a glimpse of the World Market Center's massive buildings as we began to fly up the west side of the Strip. Much of this leg of the tour went by in what I can only describe as a beautiful blur. I do remember passing above the golden Trump Tower and the volcano at The Mirage. As luck would have it, we floated over the Bellagio while a fountain show was in progress—and that was breathtaking. Afterward we traveled the path of the I-15 and by the colossal CityCenter project, where the nearly completed Aria and Vdara resorts dominated the landscape. I could hear a recording of Elvis' song "Viva Las Vegas" playing in my headset. Its lyrics perfectly summed up how I felt at that moment: "Bright light city gonna set my soul, gonna set my soul on fire." 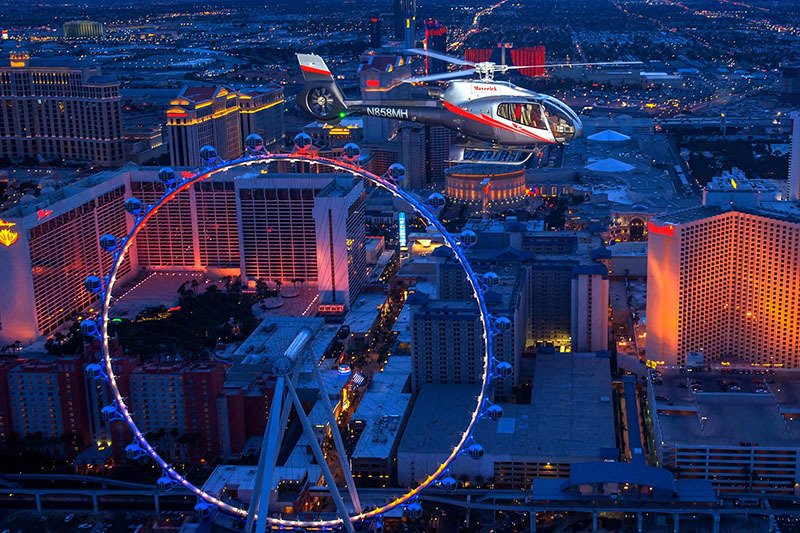 Indeed, the lights of Las Vegas are something everyone should see and I highly recommend doing it via Maverick Helicopters' Vegas Nights tour. I think I could take this flight 10 times in a row and still find new things to marvel at, as the experience is an ever-changing visual wonder. 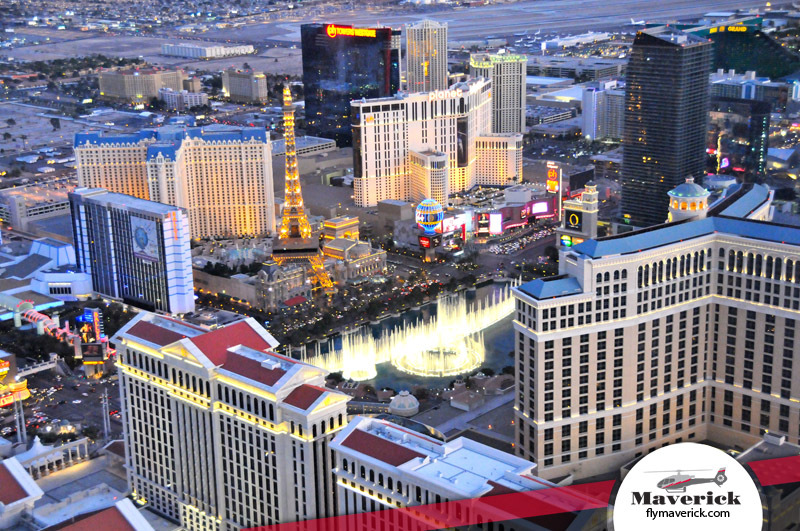 Not only will you revel in the lights—but you'll be convinced that Las Vegas is the most beautiful city on earth!